Alaska is a cold place, so I guess it makes sense that brewers situated in that bleak environment would resort to big, heavy malts and lots of booze. And thank God that they do, because I love those beers. Midnight Sun exemplifies this approach, with a line of impressive imperial stouts, one of the best barleywines I've ever had, and now this barrel aged monstrosity. In Old Norse literature, Berserkers were warriors who dressed in bear pelts and fought with an uncontrollable, trance-like rage. It's speculated that they entered this state of wild fury through the use of drugs, though probably not a depressant like alcohol. These days, it's mostly a cheesy reference or way to describe comic book characters like Wolverine. And also this beer, a bourbon barrel aged imperial stout brewed with maple syrup and molasses. I sure do enjoy me, well, all of those things, so let's get to it. My love for you is like a truck, Berserker! Beer Nerd Details: 12.7% ABV bottled (22 ounce bomber). 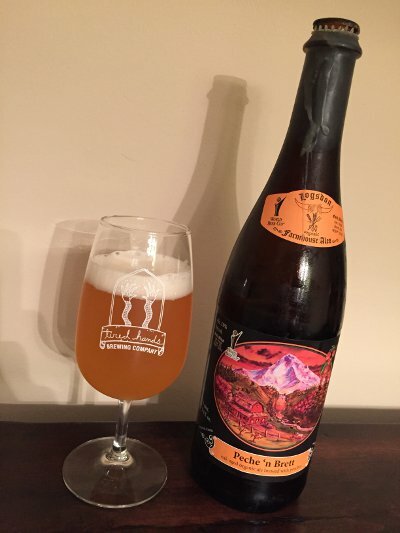 Drank out of a snifter on 5/15/15. Vintage 2015. 30 IBUs. 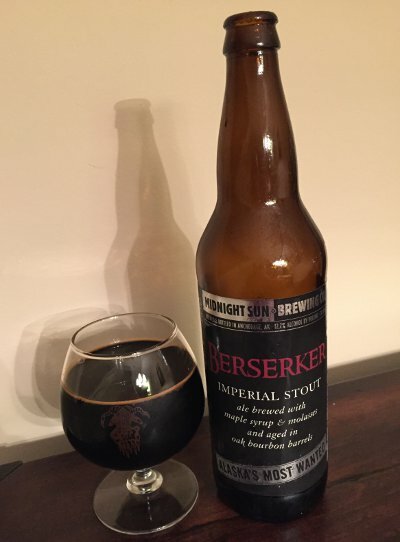 There is a beer called Son of Berserker that is made from the second runnings of Berserker's no doubt large malt bill, and honestly, at this point, I'm down for just about anything from this brewery, the bigger and burleyer, the better. Of the west coast ballers of hoppy beer, Alpine seems to be among the top tier. Hushed tones and angelic choirs, I have been craving their wares for many a moon. I finally managed to snag a bottle in a cross-country trade, and then I find out that they've started distributing to Philly. 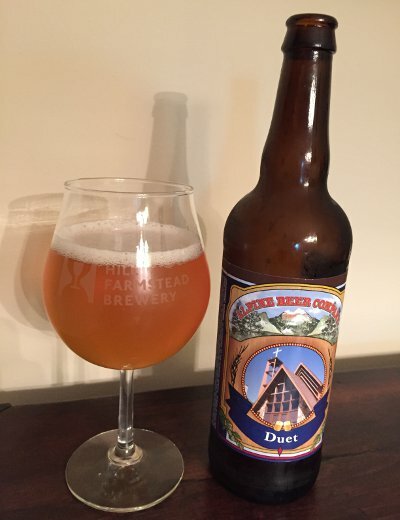 Literally the day after I received this bottle of Duet in the mail, I spy a local beeratorium tapping 3 of their most sought-after beers. It turns out that Green Flash's recent acquisition of Alpine has translated into more production and wider distribution. Go figure. If this bottle is indicative of the trend, it is a most welcome development! Beer Nerd Details: 7% ABV bottled (22 ounce bomber). Drank out of a Charente glass on 5/8/15. Naturally, I have another beer on its way: Alpine Nelson. But I may apparently be able to dig up some others locally as well. Naturally, these folks have made a rather fantastic first impression in a pretty competitive category, so I'm looking forward to more. Beer Nerd Details: 10% ABV bottled (750 ml). Drank out of a flute glass on 5/8/15. Bottle No. 12628. Best by: 01/2020. I've been doing a better job keeping up with Forest & Main's bottle releases lately, in part because they're such low-pressure affairs. Unlike a Tired Hands release, where you need to arrive at least a couple hours early, I can roll up right around opening time and still snag a bunch of bottles. People do wait in line, but it's definitely a more relaxed atmosphere and everything moves swiftly once the doors open. Oh yeah, and the beer's pretty good too. Two beers at the latest release. 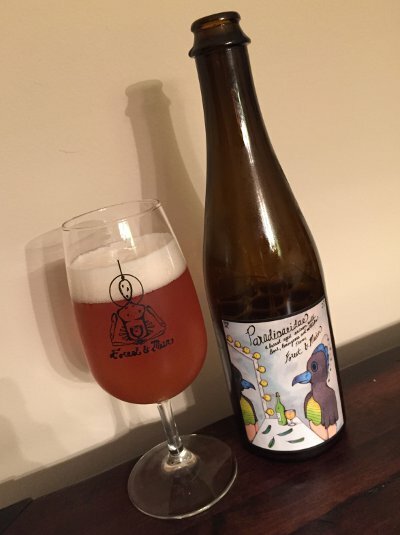 One was Paradisaeidae, named after a family of birds known as the Birds of Paradise, a barrel-aged saison brewed with Forest & Main's local saison yeast, conditioned on lemongrass and lime, and dry hopped with Motueka. 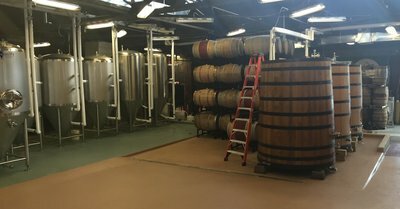 I never knew this, but Forest & Main's saison yeast is foraged from a variety of flowers and fruits growing within a few blocks of the brewpub ("Cultures from mulberries, cherries and honeysuckle made the final cut.") They switch up the yeast every year, so you can expect significant variations between vintages. As per usual, solid work from Forest & Main. Always consider heading up there and should really visit more often. I am getting better, I swears. No, this beer is not named for the awesomely badass shark. Like all of Hanger 24's Barrel Roll series beers, it's named after an aerial maneuver which is, in itself, named after the badass shark. I think. I mean, I guess it could also be named after, you know, the head of a hammer. But I prefer to think it's the shark that drove the name. It's a turn-around maneuver where the plane goes vertical, appears to stall, then rotates as the plane descends in a quarter loop so that it's made a full 180° turn. Or something. I'm clearly not a pilot, and haven't even really played one in video games. 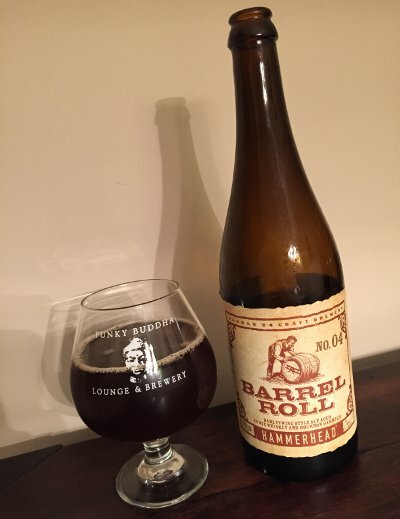 Hangar 24 Barrel Roll No. 4 Hammerhead - Pours a deep, dark brown color with half a finger of slow forming head. Smells sticky sweet, toffee and caramel, werthers original, a little bourbon, oak, and vanilla, a sorta rum-soaked fruit thing going on too. Taste is very sweet, some sticky toffee, light caramel, brown sugar, rum soaked fruit, with boozy bourbon hitting in the finish. The mouthfeel starts out in a way that makes you think this is a big, rich, chewy, full bodied beer, but it quickly thins out a little, with the barrel aged richness dissipating into the hot, boozy finish. It is perhaps not as hot as Pugachev's Cobra, but it gets the job done. Overall, this is a pretty great barleywine, not quite top tier, but well worth the stretch. A high B+, maybe A- territory, but will need to try again. If only someone would twist my arm and give me another bottle. Beer Nerd Details: 13.9% ABV bottled (750 ml caged and corked). 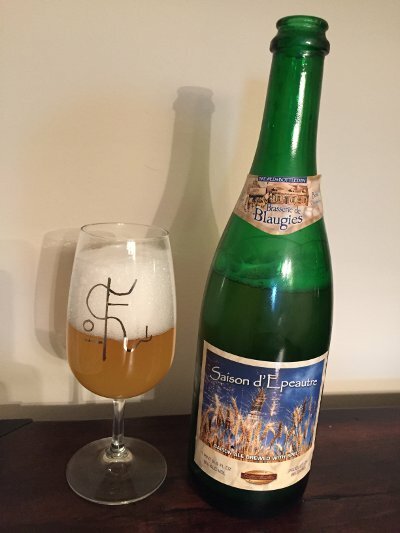 Drank out of a snifter on 5/2/15. Vintage: March 2015. Would be really curious how a spell in the cellar would treat this one, and may actually have an opportunity to try that out. In the meantime, will be brushing up on my aerobatics and on the lookout for more Barrel Roll beers. Remember all the paranoia about Satanic cults back in the 80s? This manifested in many ways, but one of the coolest is something called backmasking. That's when you can discover a hidden message if you play a recording backwards, usually something Satanic or generally meant to corrupt the youth of the day. The Beatles famously popularized the notion of backmasked music, but thanks to human beings' predilection for pareidolia (i.e. finding meaning in something that is random, like shapes in the clouds), rumors of hidden messages became rampant in the 60s and 70s (the Beatles' good natured exploration came back to plague them later with rumors of Paul's death). None of this was new, of course. Thomas Edison noticed the phenomenon almost immediately after inventing the phonograph, and even the Satanic connection dates all the way back to 1913, when Aleister Crowley wrote a book that advised those who were interested in black magic to "learn how to think and speak backwards." Along with related paranoia surrounding subliminal messaging, backmasking and satanism peaked in the 80s and has subsided as it's been proven that such techniques aren't exactly effective. But it's fun to go back and read all those irrational fears. So this beer is an ode to that Satanic scourge, with a perfectly executed label. Very much fitting with Three Floyds' brand. Oh. Oh no, I'm talking about branding now. What is wrong with me? Please forgive me, dear reader, I deal with this stuff for my day job sometimes. I try not to let it bleed through to the beer blog and... why are you looking at me like that? Stop judging me! Beer. The beer! So this is a relatively straightforward Oatmeal Stout that is variously reported as 6% or 8% ABV, depending on who you ask. I'll assume 8% because that's what Three Floyds' website sez, even if their labels frustratingly omit ABV for some unfathomable reason. I was going to try and unearth some Satanic messages in this beer, but decided that "drinking beer backwards" would not be very fun (and apparently peeing doesn't count) so I'll have to lead it as an exercise for the reader, if you're so inclined. Three Floyds BackMasking - Pours a deep black color with a finger of tan head that has decent retention and leaves a little lacing as I drink. Smells sweet, dark malts, but not super roasty, not quite caramel or toffee either, but closer to those than your typical stout. Taste is where the roasty hell-like notes come in to play, brimstone and the like, but there's lots of other things going on. 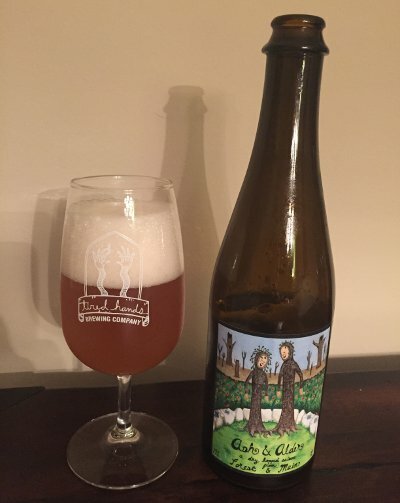 Not as sweet as the nose would imply, but it's got notes of caramel and vanilla, some faint piney hops and a little hop bitterness towards the finish. As it warms, the hops come out a little more. Mouthfeel is medium to full bodied, thinner than expected but still pretty substantial, well attenuated, faintly satanic, plenty of carbonation and a silky feel. Overall, it's a rock solid moderate-ABV stout, well worth seeking out. B+ would try again. Beer Nerd Details: 8% ABV bottled (22 ounce bomber). Drank out of a snifter on 5/1/15. As always, Three Floyds is worth the stretch and they have great brandin... dammit, I'm doing it again. Leave me alone, I learned it from watching you! What? I'm... sorry, I don't know what is going on right now. Beer Nerd Details: 6% ABV bottled (750 ml caged and corked). Drank out of a flute glass on 5/2/15. Well, now I need to go find everything Blaugies ever brewed. Super. I like puns as much as the next fella, hell I'll even chuckle at the most overused of beer puns: the hop pun. But even I have to question the wisdom of naming your beer with a pun that refers to one of the most devastating pandemics in human history. Welcome to the Raccoon Lodge & Brewpub, here's your bottled pestilence! On the other hand, it is a beer soured with bacteria, so there is a certain sense of propriety, I guess. Consider my question withdrawn. 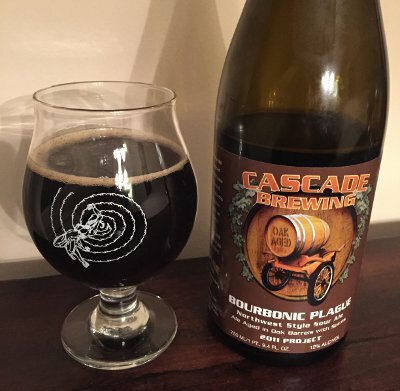 Cascade Bourbonic Plague - Pours a dark brown color with a finger of light tan head that quicky fizzes down to a ring around the edge of the glass. Smells funky, a little sour, but you get some spice and vanilla (almost like a coke), oak, maybe some vinous fruit, and something deeper and darker lurking in the background. Taste is very sweet, some of that vinous fruit, a nice sour punch, rich dark malts (but not roasty at all), spice and vanilla (again with the almost coca cola character, like if coke was sour? Maybe not the best description, but there's something to it), and some booze, maybe even actual bourbon (not Cuvée De Tomme levels, but it's there). Mouthfeel is full bodied and rich, a little heavy and acidic, nice booze factor. Intense, complex, and interesting, it's a sipper for sure, and probably should be shared. Overall, a fascinating piece of work, not sure I've had anything quite like it. B+ but certainly worth seeking out. Beer Nerd Details: 12% ABV bottled (750 ml caged and corked). 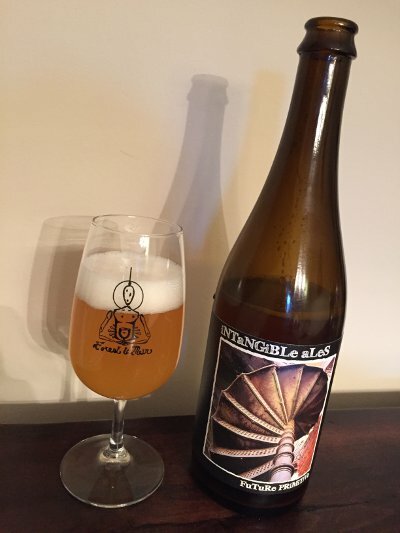 Drank out of a snifter on 4/25/15. Vintage: 2011 Project. Yet another interesting winner from Cascade, and at least one more in the pipeline sometime in the near future. Not to mention lots of their beers that remain unexplored territory for us... territory we'll surely enjoy charting. 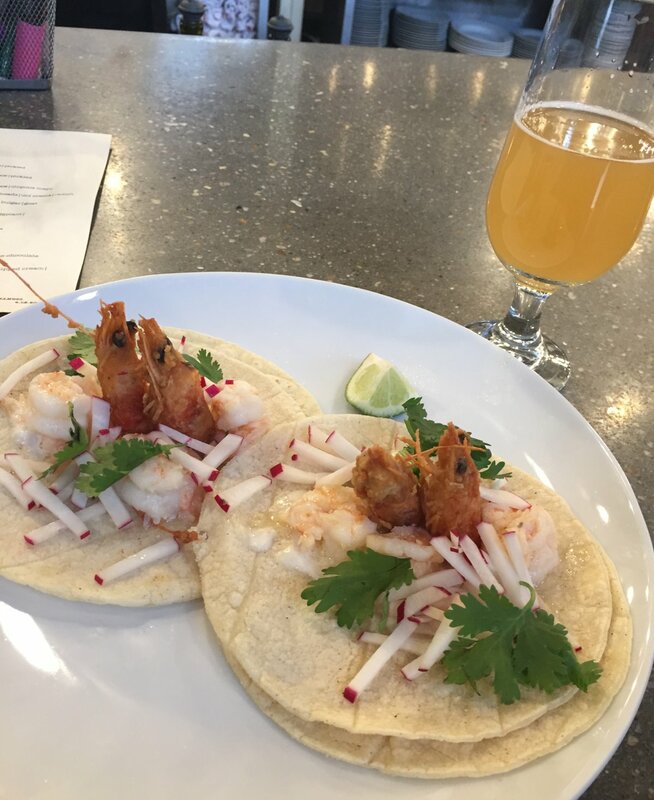 A Trip to the Fermentaria! 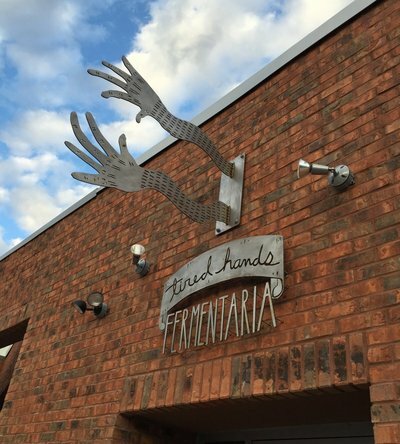 This past Friday, Tired Hands Brewing Company opened up a new location that they've dubbed the Fermentaria. 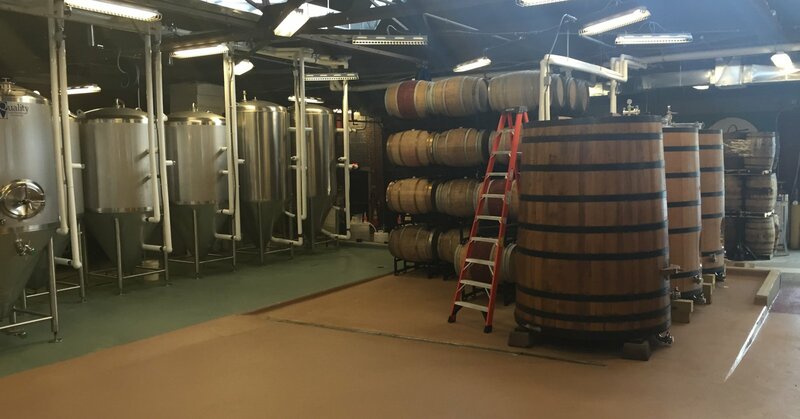 It's a much larger space than the original Brew Cafe, with greatly expanded brewing capacity (topping out at 10,000 barrels a year, more than doubling their current capacity), a much more spacious, open environment, and a full kitchen menu. Located just a couple blocks away from the Brew Cafe, they did a great job with the building. 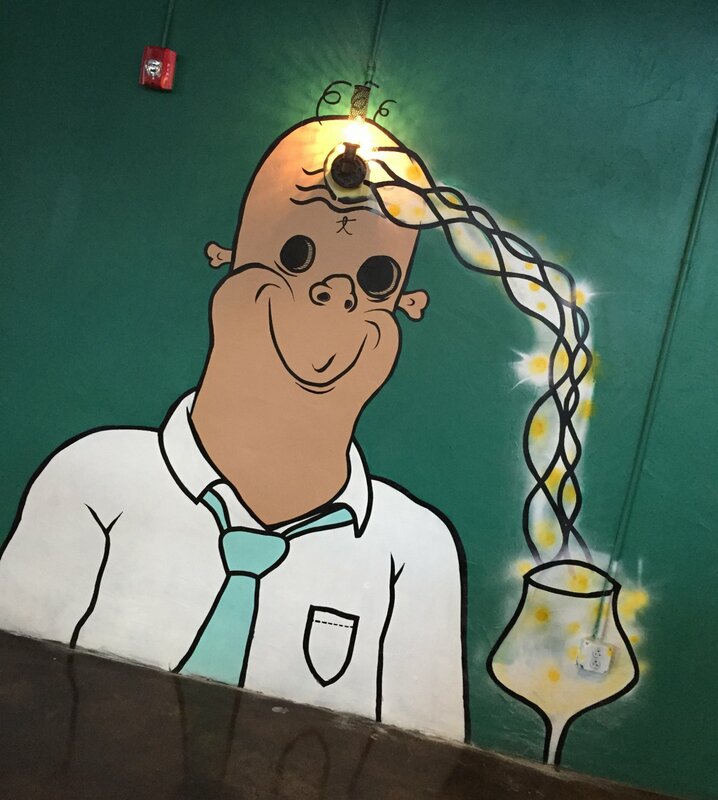 It feels very different from the original location, but with the same spirit, perhaps due to the their unconventional artwork and general attitude. 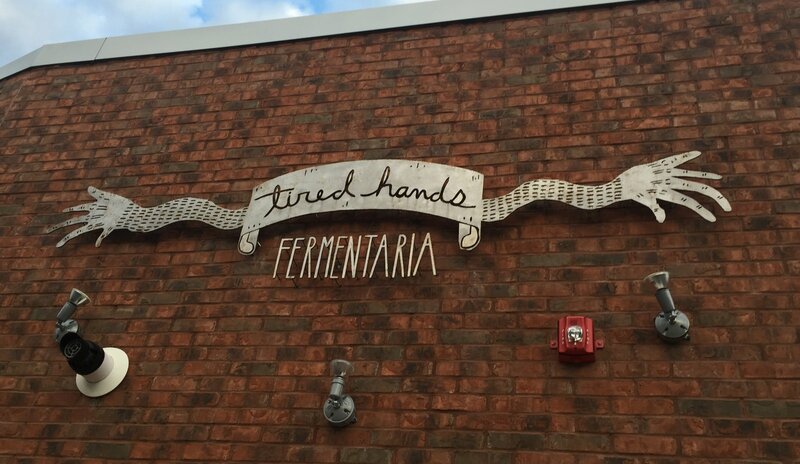 I go to Tired Hands more often than any other beeratorium, and while it seems I'll be splitting my time between the Brew Cafe and Fermentaria, I don't see that changing much any time soon. Right now, it seems that the main difference is the menu, though time will tell if things start to converge or diverge in terms of the beer list and menu (surprised that the new location doesn't have charcuterie or Tired Hands famous bread, for instance). Congrats to the Tired Hands team! I've always loved how small and intimate Tired Hands was, but the secret's out, and they're going to be making big waves. From what I've seen so far, this expansion won't change much, except getting their beer in front of more people. I'm a greedy man, but I can't find fault in getting Tired Hands more exposure! Update: Holy hell. It's a thing of beauty. Poetry. Should have sent... a poet. Pizza Boy brewing cohabitates with Al's of Hampden (an actual pizza joint), which I tend to think of as basically the same operation, though I guess distinctions need to be made. I'm sure there's some nerdy, pencil-pushing reason for such distinctions, but whatever. Enter Intangible Ales. Brewed at the same location. Using the same equipment. By the same brewer. Wait, why is this a separate brand now? What are you central PA people getting up to over there? And while we're at it, this beer is technically called FuTuRe PRiMiTiVe - what do you have against vowels and normal capitalization? What is going on? GET OFF OF MY LAWN! Beer Nerd Details: 7.2% bottled (750 ml caged and corked). Drank out of a flute glass on 4/24/15. Batch #1. Bottle #265/2700. Pizza Boy continues to impress, even when it's an alternate label like this. I should really explore more of their stuff, and will probably do so soon enough. Stay tuned.